I am so excited to bring you this BRAND NEW Stand-Alone Program! If you’ve never worked with me on Levels of Relationships®️, get ready to watch ALL numbers in your business SHIFT quickly. If you have worked with me on Levels of Relationships®️, get ready to integrate this formula like never before. The growth you’ve already seen, it’s time to ramp it up, and to utilize the formula the way it’s fully intended to be used. This is something different from how we’ve been conditioned, trained, taught… This formula is SHIFTING the way our clients are SERVING in their business, SHIFTING to such an abundant way of doing things. You will see far greater returns, outcomes, and results. I am going to roll-up my sleeves with you, we are going to do this together, you will have such a CLARIFIED, ALIGNED, RESULTS-DRIVEN Plan By October 2, just in time to maximize and blast through your Goals this Holiday Season. 1. A High-Results Formula That Is Guaranteed To Change Your Financials. 2. You’ll Be Guided Step-By-Step In Raising The Level Of Relationships®️ With Your Entire Client List. 3. 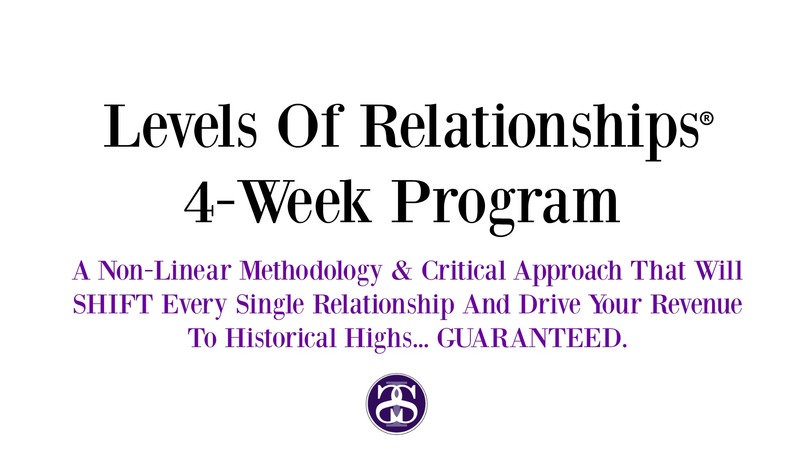 Receive Blueprints SPECIFIC To Your Business On How To Maximize Every Relationship. 4. Our Clients Are Seeing An Average Of A $1200-$1800/Month Increase In Their Financials By Using Our LOR Formula. 5. Increase Your Retention, Your Pre-Book, Your Retail, Your Service Dollars Naturally, Authentically, and Confidently. 6. Learn How To Seamlessly Reactivate Clients You May Have Let Slip Through The Cracks. 7. This Program Will SHIFT Your Business In The Most Profound Way. Expect Historical Highs In Revenue. You Will Be Added To A Private Facebook Group That Will Support Your Success. Get Ready For A Record-Breaking Season In Business!! Quick Note: I am capping this program with the number of participants. Why? Because I want to make sure I give EACH of YOU exactly what YOU need for your business and your goals. Here’s To A Whole New SEASON In Business! As I write to you this week, I am 35,000 feet up in the air on my way to one of my beautiful, forward-thinking, industry changing Salon Teams. I can’t wait! They Are Playing A Limitless Game. Every single flight, I do the same thing… I sit here for a moment, looking out the window, looking at the playground in life, the arena to show-up in, the limitless opportunities to live more on purpose and more in truth. I get excited about the limitless life intended for us all. I’ve had a full week of Trainings, Live Events, Individual Coaching sessions, and Mentoring hours. By no mistake, an absolute majority of this week’s conversations have been incredibly similar. I am not a believer in coincidence… I am clear on divine timing. I believe this message is necessary right now, today. Which Is Exactly Why I Wanted To Share This With You. You Might Have Had The Same Thoughts… My Guess Is If You’re Part Of Our SSI Community, You Must Have. Every conversation this week has been about… The DESIRE TO LIVE LIFE BIGGER, LIVE GREATER, LIVE WITH MORE INTENTION. The conversations have been so clear on the readiness to Serve Greater, Live More Intently, and Many Souls Are Having New Levels of Conscious Awareness that has created an internal FIRE much stronger than before. Can you relate? It’s the burning desire inside that’s so strong that you know what to do, but you’re stuck on moving ahead. So, here’s a small snippet, a checklist of what we discussed, in order to make it happen…NOW. The more you authentically show-up as YOU and the less you apologize for your TRUE DIVINE Essence…the more ALIGNED Life becomes. It’s Your Time. Yes, Now Is Your Time. There’s No Time To Waste. It’s Time To Stand In Your Power. Go For It… The World Is Waiting On The Special Gift Of YOU. You’re meant to live in Authentic Abundance, You’re Meant To Be The Beautiful You That You Already Are, Without Hesitation and Without Apology. Share with me what’s been going on for you…. Tell Me About Your Purpose and How You’re Intentionally Living Life In A Greater Consciousness, Capacity, and Conviction. To A Brilliant You, A Magical Week, And An Abundant Future! How Are Your Service Dollars, Retail Sales, Add-On Services, Pre-Booking %, Client Retention Numbers, Referrals? Stagnant, Decreasing, Or Even Non-Existent?? How Are Your Service Dollars, Retail Sales, Add-On Services, Pre-Booking %, Client Retention Numbers, Referrals? Stagnant, Decreasing, Or Even Non-Existent?? 1. ENERGY~ Where’s your ENERGY these days? Up or Down? Your energy will predict your sales…always. Your energy will set the stage for the day. So, if you walk into your salon or spa with low energy, it will impact your team, your clients, and ultimately your sales. 2. ATTITUDE~ What’s your ATTITUDE like? If you’re frustrated and finding yourself operating primarily from the negative mindset, your outcomes will be negative as well. You’ve got to intentionally look for the positives in every situation in order to progress forward. 3. ENGAGEMENT~ What’s your Level Of ENGAGEMENT currently? In other words, are you engaged in the process? Are you excited about the mission and vision of your Salon & Spa? If you’re finding yourself dreading going into the salon or feeling defeated, you’ve got to call a time-out so you can gain clarity around why you’ve dis-engaged from the process. These factors have more impact on your numbers than any business strategy or sales formula ever will. Because when you’re not enthused, excited, energized, or engaged in the process of serving your clients… There’s simply not any business strategy around that will shift your numbers the way YOUR BEING-NESS will shift your numbers. Reach Out To Your Clients, Serve Humbly, Live Your Purpose! PS. When you’re more energetic, operating primarily from positive a mindset, and you’re more engaged in the process of serving your clientele at great capacity… The more your clientele will remain loyal, spend more money with you, and send you a steady stream of referrals. Your Vibe Attracts Your Tribe!! It feels so draining, exhausting, frustrating… A buzz-kill like no other when you’ve put so much work into something or someone, only to have it come back and feel like a slap in your face, a punch in your gut, or like you’ve been knocked down at your knees. You know that feeling, when you’ve put your heart and soul into something or someone… The hard work, the trust, the opportunity, the patience, the time, the energy, the support you’ve given and it feels like it all got turned-around, upside down, sideways, twisted, corrupted, de-valued and came careening back to you at warp speed without warning… Yeah, that feeling! It hurts deeply, doesn’t it? Then, you find yourself questioning what you’re doing, why you’re doing it, how you’re doing it. Your Mission/Purpose suddenly comes into question, you question your very own value or existence, your impact on the world, and your ability to make a difference. It’s an emotional roller coaster… And every turn, loop, hill, and drop triggers a different emotion. While it’s so important to honor your feelings and your emotions… You can’t allow yourself to get caught-up in them, paralyzed by the fears they trigger, lose sight of your goals, or fall off your path of purpose and mission. What happens to YOU, has no impact on your Personal VALUE. Your VALUE isn’t based on someone’s bad day, someone’s opinion of you, or someone’s perception of you. Your VALUE isn’t determined by outcomes, set-backs, mistakes, or perceived failures. Your VALUE isn’t defined by what other’s project towards you. Your VALUE isn’t a day-to-day rate change in the marketplace. Your VALUE isn’t a compilation of the past. Your VALUE isn’t a mirror of your bank account. Your VALUE isn’t open for debate. Your VALUE is YOU. Your beautiful, unique, special, talented, and carefully created YOU. Your VALUE is precious and priceless. You must go inside of yourself. You must get quiet. You must get connected to the greater power within you. Connect to your SOURCE. It’s where you find your Authentic Power, your Confidence, your Purpose, Passion, and Mission. It’s where you find your Light, your higher frequency of vibration, and your energy. It’s where you’ll re-discover your inner joy, peace, happiness, and unconditional love. There’s NOTHING EXTERNAL, nothing outside of you that can change your VALUE… It’s ALL Inside of You. It’s ALREADY Inside of You! You’re Worthy, You’re Highly Valued, You’re Greatly LOVED! Are You Ready To GROW Your Business From Good To GREAT? And There’s Things On The Outside Of You Getting In Your Way. Think back to when you had the most grandest vision of your life. You knew exactly what you wanted to do, why you wanted to do it, and you knew in the depths of your soul…YOUR calling in life. Maybe you went for the career of your dreams or maybe you’ve been turning your back on what you really want to do in fear of causing upset, disappointment, or letting other people down. Maybe you’ve shifted your standards to accommodate others. Maybe, you’ve become a spectator in your own life because it’s been easier to watch your life pass you by versus defending your natural brilliance, authenticity, and pure genius. Life can been difficult no doubt, with unfair circumstances, unfortunate events, unnecessary conflict, unprovoked mishaps, choices we’ve made that throw obstacles our way. All of it makes life challenging. But, that doesn’t mean we can quit on ourselves. Regardless of your past, YOU STILL HAVE A CALLING… YOUR CALLING. Yes, you’ve made some mistakes, but you’re not a failure. Yes, you may have been inconsistent, but you have the ability to be consistent. Yes, you may not have met your goals, but that doesn’t mean you can’t. Yes, you may have been told you’re not good enough, but you are. Yes, you may have felt you’re not ever going to have what you want, but I am telling you, YOU CAN! You Can’t QUIT On Yourself Any Longer! You Can’t Let The World Dictate Your Future. If you’re a Hairstylist, Esthetician, Make-up Artist, Massage Therapist, Beauty Expert, Wellness Advisor, Salon Owner, Leader, Spa Director, Cosmetology Student, Educator, Product Distributor… You have a calling and you’ve got to start using your limitless potential, amazing talent, and undeniable authentic genius. One of the main reasons I created our 90-Day Coaching Program is for you to re-discover the real YOU. The YOU before life’s circumstances stopped you in your path. The YOU before you were told to be someone else. The YOU before you were told you weren’t good enough, smart enough, or talented enough. I am a believer that if you had the grandest vision of your life or have the grandest vision… You’re Meant To Live It! In the 90-Day Coaching Program, we start uncovering the real you, we help you find your true self again, we help you tap into the genius that you already are, we get you living your Authentic Life so you can stop “faking it till you make it”, because that won’t create the abundant life you’re meant to live. The 90-Day Coaching Program challenges you through the right kind of pressure, gets you operating at higher levels of accountability, and helps you create new standards that you want to be living and attract those in your life with the same clearly defined standards. The 90-Day Coaching Program will help you dramatically increase your service dollars, retail sales, retention levels, referrals, and so much more! The 90-Day Coaching Program Is More Than Just Dramatically Increasing Your Income, It’s About Re-Discovering The REAL YOU! Our next 90-Day Coaching Program starts May 15. But, I want you to start NOW. If you register today, I will start working with you tomorrow… I will give you an extra month of coaching at no additional charge! I want you to start getting to know the Real You again. The You that is excited about life, your career, your relationships. The You that has endless energy to create the life you love. The You that is refusing to quit on yourself. The You that sees all the greatness in and around you. The You that will never ever ever settle again. Are You Ready To Let Go Of The Things That Are Stopping You In Your Tracks? Are You Ready To Take Your Life On Again As A Full Participant? I am so excited to do this with you! I know you’re going to have great success! For More Details On 90-Day Coaching Click Here. My team is standing by, ready to answer your questions, ready to get you started, all you have to do is say YES TO YOU and register online or Call my Team at 1-888-709-9342. Register Today and Receive An Extra Month Of Coaching For Free! To Your Future, To Your Calling, To Your Purpose! PS. If you’re a 90-Day Coaching Alumni, call our Team Concierges For Graduate Pricing! Think back to when you had the most grandest vision of your life. You knew exactly what you wanted to do, why you wanted to do it, you knew in the depth of your soul your calling in life. Maybe you went for the career of your dreams or maybe you’ve been turning your back on what you really want to do in fear of causing upset, disappointment, or letting down. Maybe, you’ve lowered your standards to accommodate others. Maybe, you’ve become a spectator in your own life because it’s been easier to watch your life pass you by versus defending your natural brilliance, authenticity, and pure genius. Yes, you’ve made some mistakes, but your not a failure. Yes, you’ve been inconsistent, but you have the ability to be consistent. Yes, you’ve may had not met your goals, but that doesn’t mean you can’t. Yes, you’ve been told you’re not good enough, but you are. Yes, you’ve felt you’re not ever going to have what you want, but I am telling you, YOU CAN! You Can’t QUIT On Yourself Any Longer! You Can’t Let The World Dictate Your Future. You have a calling, you have something right now in front of you that you’re supposed to be doing. If you’re a Hairstylist, Esthetician, Make-up Artist, Massage Therapist, Beauty Expert, Wellness Advisor, Salon Owner, Leader, Spa Director, Cosmetology Student, Educator, Product Distributor… You have a calling and you’ve got to start using your full potential, amazing talent, and undeniable authentic genius. One of the main reasons I created our 90-Day Coaching program is for you to re-discover the real YOU. The YOU before life’s circumstances stopped you in your path. The YOU before you were told to be someone else. The YOU before you were told you weren’t good enough, smart enough, talented enough. In the 90-Day Coaching program, we start uncovering the real you, we help you find your true self again, we help you tap into the genius that you already are, we get you living your Authentic Life so you can stop “faking it till you make it”, because that won’t create the abundant life you’re meant to live. Your Past Doesn’t Matter… It’s The NOW That Counts. The 90-Day Coaching Program challenges you through the right kind of pressure, gets you operating in higher levels of accountability, and helps you create the high standards you want to be living and attract those in your life with the same standards. The 90-Day Coaching Program Is So Much More Than Just Dramatically Increasing Your Income, It’s About Re-Discovering The REAL YOU! Our next 90-Day Coaching Program starts October 24th. But, I want you to start NOW. Are You Ready To Let Go Of The Things Outside Of You That Are Stopping You In Your Tracks? I am so excited to do this with you! My team is standing by, ready to answer your questions, ready to get you started, all you have to do is say YES TO YOU and register online or Call my Team at 1-888-709-9342.